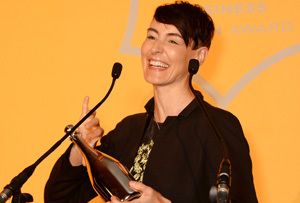 The tech firm co-founder won the Businesswoman of the Year award, while Propercorn's Cassandra Stavrou scooped a gong too. One person who’d be forgiven for nursing a headache today is Sarah Wood, co-founder of the advertising tech start-up Unruly. She has just been crowned Veuve Clicquot’s Businesswoman of the Year after all. In fact, she’s bright-eyed and bushy-tailed, and found the time to speak to MT in between a raft of broadcast appearances. ‘It was such a fantastic party, but I made it home for my children’s bed time, so I’m actually feeling in really good spirits,’ she says. The other finalists were Clare Gilmartin, the CEO of Trainline, and celebrity make-up artist Charlotte Tilbury, who set up her own business in 2013. The judges (including MT’s editor Matthew Gwyther) pointed to Wood’s demonstration as a standout female role model and Unruly’s international growth as a clear indicator of success – the tech company has expanded to 15 offices and 200 staff since 2006. Wood was also crucial in Unruly’s acquisition by Rupert Murdcoch's NewsCorp late last year in a deal worth a cool £114m. Propercorn co-founder Cassandra Stavrou also had a good night, pipping dating app entrepreneur Robyn Exton and Entrepreneur First’s Alice Bentinck to the New Generation award, which celebrates upcoming talent. Stavrou formerly worked at ad agency BBH, but quit her job and spent a couple of years living back at home with her parents while cooking up recipes for her budding business. Since launching in October 2011, Stavrou’s healthy popcorn business has steamrolled into 15,000 stockists, including Waitrose, Tesco and Boots and is available across Europe. By the end of last year it had made annual sales of £9m, selling three million popcorn packets a month. She said, ‘It’s such an honour to receive the New Generation award and to appear alongside such an impressive group of finalists. The awards are an amazing celebration of entrepreneurs from around the world.’ Time to crack open the bubbly?